Born just as the British Empire was taking its last breaths, Martin Adeney was part of the ‘twilight generation’ caught between the imperial and postimperial ages, forced to navigate the insecurities – political, economic and cultural – faced by the British as we struggled to understand and adapt to our diminished place in the world order. 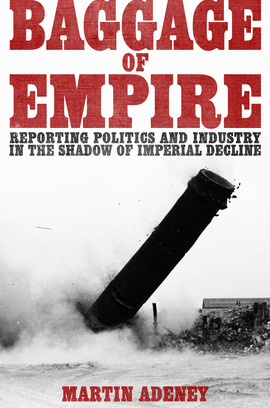 A compelling blend of memoir and narrative history, Baggage of Empire leads us through the crumbling ruins of great industries and imperial trade cities; from the retreat of the northern newspaper empires to an almost exclusively southern, metropolitan viewpoint; through the tumultuous dominance and decline of the trade unions; to the rise of Thatcherism and big business. From the unique vantage point his career as a journalist has given him, particularly as industrial editor of BBC TV, Adeney notes that many of the issues that preoccupied us in the late ’60s and early ’70s – including immigration, housing, education, industry and communications – remain the daily currency of our political discourse. Despite all of our material prosperity and cultural self-confidence, we are all burdened, in one way or another, by the baggage of empire.